Tucked in from the Pacific on a segment of Highway 1 that winds east around Humbug Mountain, Humbug Mountain State Park Campground is an obvious overnight choice if you are exploring the Oregon coast between Port Orford and Gold Beach. Whether you are hiking Humbug Mountain, strolling on the gorgeous beach accessible from the campground, or playing in the waves north and south, this campground is a clean, solid choice for a base camp. 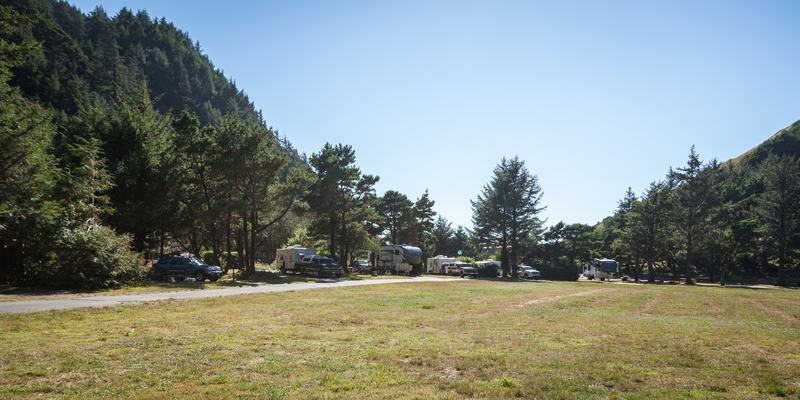 The campground shares the narrow valley floor with the Oregon Coast Highway, Brush Creek, and Dry Run Creek. Unfortunately, this means that road noise is audible throughout much of the campground; on the other hand, the year-round campground is naturally very protected from the elements and may be quite a respite when the weather turns. The campground is divided into a small loop closest to the entrance, and a larger loop where the amphitheater, firewood, and beach access trail are located. A hiker/biker camp is located between the two loops and is a great option for those travelling along Oregon Coast Trail. Each loop has its own restroom facility with flushing toilets and hot showers. Of the 95 sites, 55 are tent sites, and 40 have water and electrical hookups. Two of these are ADA accessible. Privacy is not a strength of the campground. Some of the tent sites are densely situated, and all southern sites will experience more road noise. That said, some sites have the vegetation and the space to allow for a more private tent experience. Humbug Mountain State Park Campground is open year round and becomes busy in the summer. Reservations are recommended. The hiker/biker campsites are on a first-come, first-served basis.